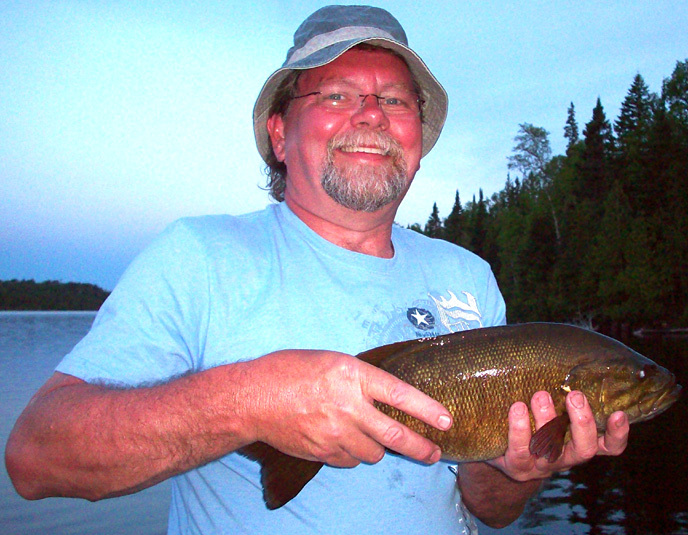 Smallmouth Bass are plentiful in Prairie Bee Lake and really easy to catch. In the very early spring the Smallmouth Bass don't seem to feed in the cold water. 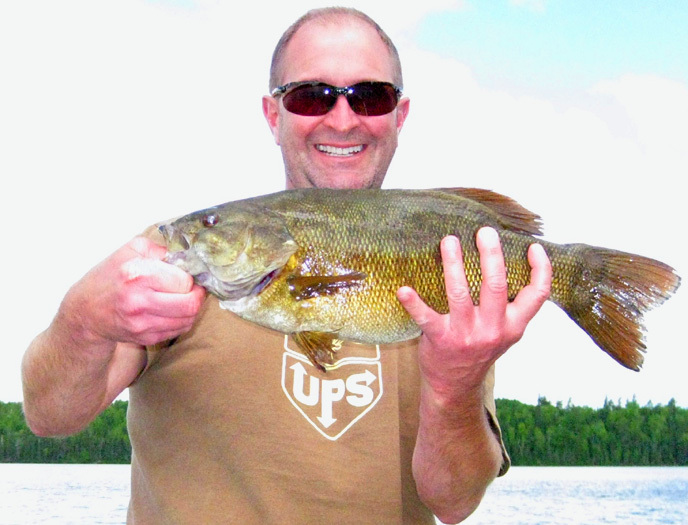 As the water warms up at the end of May, the bigger Smallmouth Bass are spawning and the males are on their nests. By late spring and early summer, the smaller bass come up from the depths and they move into the shallows and they are aggressive with ferocious appetites. The larger bass are finished with their spawn and move back to their feeding territories in the deeper water. Like most rocky Canadian Shield Lakes, the Smallmouth Bass generally travel in hunting packs of 5 to 15 fish when they are smaller in the 1/2 to 2 pound range. This is most likely for protection against Northern Pike. As they get bigger in the 3 to 5 pound range, they tend to be less mobile and stake out territories. Usually when you catch a big Smallmouth Bass there are a couple of the same size hanging around the same area so keep fishing or come back at a later time. If you run into these schools of smaller bass you should be able to catch one after another for a couple of hours. If you want the bigger Smallmouth Bass you need to work the rocky points, shoals, Islands and drop-offs that are close to shore with deeper water. Running into a school of smaller bass means you can catch 20 to 50 bass in a couple of hours. That's a ton of fun for the kids but most guests that target Smallmouth Bass want the big ones. Smallmouth Bass in the 2 to 4 pound range are common. Working the shoreline you will catch plenty. Prairie Bee Lake has also been known to produce some world class bass. If you target Smallmouth Bass then sometime during the week you should be able to catch a couple 5-pounders or even a 6 or 7-pounder. They are there but Smallmouth Bass over 6 pounds are rare. The big old bass are big and old because they are smart. You have to be quiet and study wind direction as well as wave motion. The big bass tend to feed in areas where the wind has blown minnows and bugs into a cup-bay right before a point. If the waves are too big the bass will sit off these areas in 6 to 12 feet of water. We have guests that have caught over 20 bass in a day in the 4 to 6 lb range up to 21 inches. As the water warms up to the upper 60's, the Smallmouth Bass action begins to heat up. From late spring to early fall, artificial plastics, floating, suspending, or countdown Rapalas or Thunderstcks can be used while fishing the shallow rocky waters that are in close proximity to deeper drop-offs. This technique will produce fast and furious actions for those of you seeking Smallmouth Bass action. A very effective method for catching bass is casting shorelines while tipping your artificial plastic with a piece of worm and working it back from the shoreline. Smallmouth Bass tend to like blue-&-silver or black-&-silver baits. On slow days when the bass are not super active try putting a big dangling worm on a hook with no weight and just slowly drag the worm over the rocks. 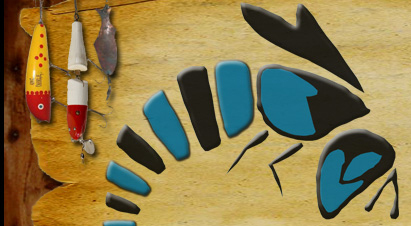 Protected size for Smallmouth Bass: Prairie Bee Lake is designated a trophy fishing lake. It is camp mandatory that all Smallmouth Bass 15 inches and above be returned to the water.